Seaside dining. What Stockholm does best. Photo courtesy of Oaxen. Fathom editorial director Jeralyn Gerba spent a few days taking in the skinny jeans, cinnamon buns, and seaside imbibing that defines Stockholm, Sweden. Ett Hem Hotel's exterior and lavish bedroom. Photos courtesy of Ett Hem Hotel. The first thing you will love about this city: how effortless good design seems to be. I stayed at and loved Miss Clara in Norrmalm, a stylish hotel offshoot of the more high-end Nobis Hotel with big windows and a hopping lobby bar scene. If you are in the mood to splurge, the most stunning retreat is Ett Hem, a tiny boutique residence where you can fix yourself an organic snack in the kitchen or arrange a formal dinner with friends in the library. 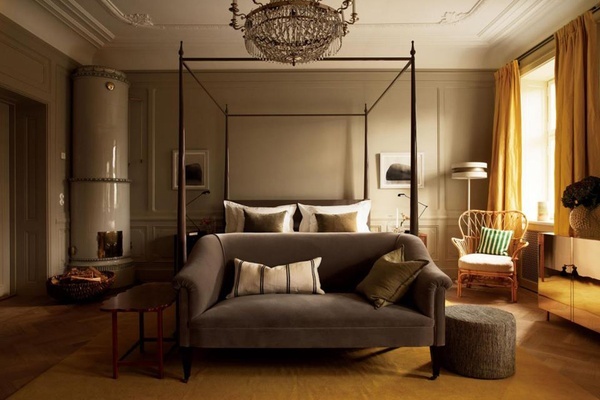 The twelve bedrooms (marble-clad tubs, balconies, fireplaces, four-poster beds) are the epitome of form-meets-function. f you can't book a room, see if they can squeeze you in for dinner. It's only a possibility when the hotel's not full, but maybe you'll get lucky. One of the best things about cafe-hopping is taking in gorgeous, old spaces rehabbed for the most democratic uses. No wonder that this is where fika (a somewhat un-translatable word that means breaking bread and drinking coffee and making merry and being cozy all at once) reigns supreme. In a space like this, anyone can feel like royalty while sipping a three-dollar coffee. 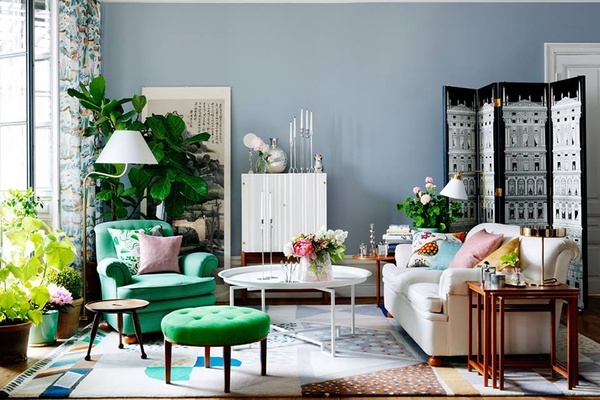 The colorful look of Svenskt Tenn. Photo courtesy of Svenskt Tenn.
Norrmalm and Ostermalm have a lot to offer in Stockholm's city center — parks, design shops, fashion outposts, a burgeoning gallery district, and tons of historic landmarks. The Stadsbiblioteket rotunda is an architectural marvel. Skogskyrkogården, a woodland cemetery north of central Stockholm, is a stunning UNESCO World Heritage site that blends man-made landforms with natural vegetation. The Royal Opera (actually built by the royals) is also really something special. Shop: There is no shortage of great shopping. After all, Sweden is the birthplace of fashion brands like Filippa K, Cos, Rodebjer, and Acne (you can find them all at the lively, multi-floor galleria MOOD). Strandvägen, a street that follows the harbor line, has nice bistros for people watching and cool Scandi homeware stores like Svenskt Tenn. Birger Jarlsgatan is a main street with shopping lanes coming off both sides (Biblioteksgatan has a COS store). My favorite kind of shopping is for souvenirs that’ll trigger the olfactory senses once you're back home. For that, sniff your way through the neat little bottles at fragrance house Byredo. Or jack up your salivary glands at licorice outpost Lakrits Roten. Dining: I could never seem to make it in time for lunch at Speceriet, but my Swedish friends give it high marks. Riche is nice for a glass of wine and snack after afternoon shopping around Ostermalm. The Stockholm group that owns it also owns Sturehof and Taverna Brillo (which are all pretty cool). Expect great seafood and crowds who want to be seen. Stockholmites bar-hop between the three of them. One of my favorite dinners happened at Mathias Dahlgren’s a la carte spot Matbaren (adjacent to his fancier experimental dining room Matbordet and tasting menu-only Matsalen). I loved the eclectic mix of traditional and contemporary design pieces and the high perches from which to fully take in the room while eating king crab dumplings, venison, and a crazy delicious riff on fish and chips. The 19th-century Operakällaren and its adjacent Opera Bar (circa 1905) are gilded and old-world and a joy to sit in for an evening. Unfortunately, there is a hideous club one floor below the bar. If you're there late enough, the music eventually wafts upstairs — a sad reminder that we are not actually living in the Art Nouveau era. Artipelag gallery space on Varmdo. Photo courtesy of Artipelag. In the summer, locals and visitors take to the waterways to explore shorelines, saunas, and summer homes spattered among the 30,000 little islands that make up Stockholm's archipelago. You can easily take the tram to this small island amalgam of Swedish culture. 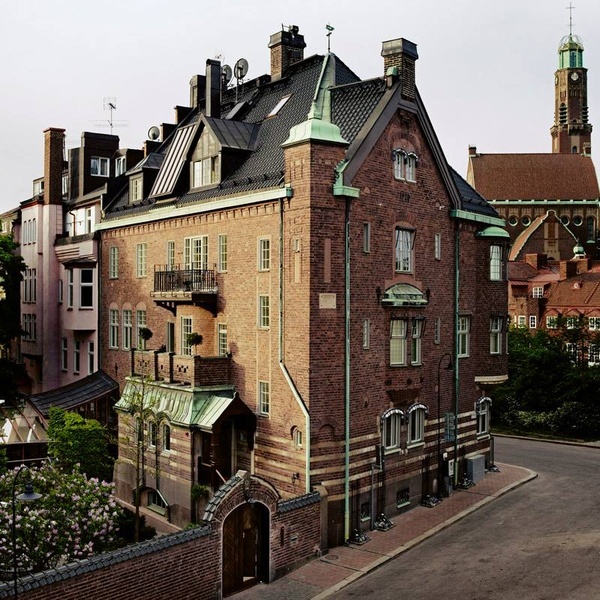 It has tons of manicured grounds for strolling, the Prince's garden, the ABBA Museum, a zoo, the world's only surviving 17th-century ship (The Vasa), a replica "olden-days" community called Skansen (it's kind of like the Swedish Colonial Williamsburg), even a funny amusement park. But I went to the island to roam Rosendals Tradgard, a working not-for-profit farm and garden nursery where you have a hearty lunch (homemade soups, breads, and sandwiches made with biodynamic produce pulled from the ground you just walked on) while sitting next to a wood-burning stove in a sunlit greenhouse. 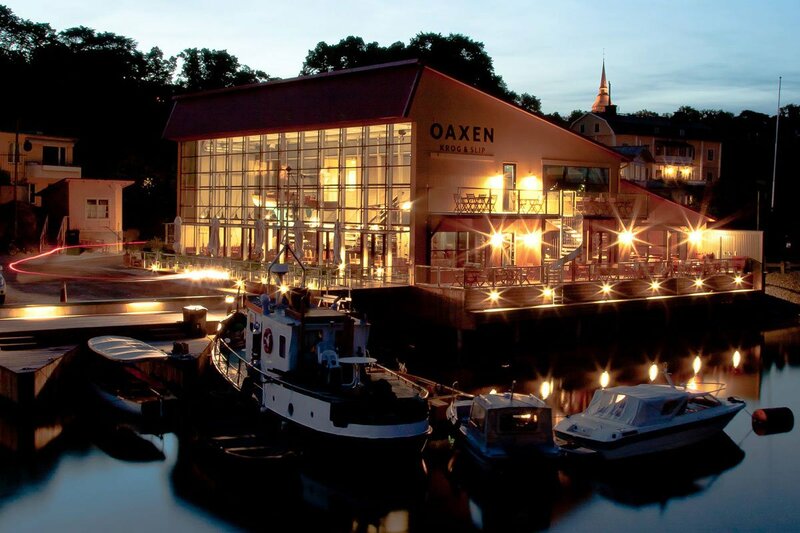 Then, even if you're already full, you must stop by Oaxen Slip, a nautical bistro in a shipyard on the water. The big industrial space is all glass and corrugated steel, with painted rowboats suspended from the ceiling. The beers are cold, the crayfish is locally sourced, and the dried pork neck is salty and snacky. 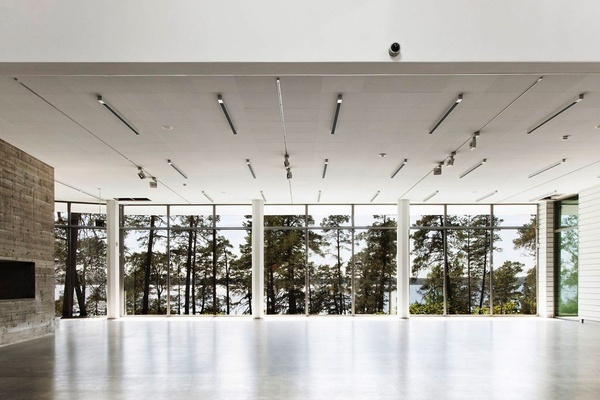 A twenty-minute boat ride from the city center and you'll be at Artipelag, a new venue for culture, design, and food. It has just the slightest whiff of hoity-toity, but you can avoid the snobbiness by taking in the elegant pine woods setting on the water. Pretty cute, but also pretty touristy. Pick up souvenirs like small wheels of cheese at Gamla Amsterdam as you cut through it to make your way to the ever cooler Sodermalm. The indie neighborhood with cafes, bars, vintage shops. Record store Snickars looks like a club house with couches, design mags, and crates of vinyl (including obscure Swedish stuff). It's hidden behind a small gallery on an adorable residential side street. On Nytorgsgatan, you'll find an Acne boutique, artisan caramel shop Parlans Konfektyr, and Nytorget Urban Deli — one part grocer, one part food hall with a lively spirit. Dancing queens will like Under Bron, a dive bar, lounge, and dance club that morphs into a sprawling indoor-outdoor hang under a bridge. FLY: You'll land at Stockholm Arlanda Airport (ARN) and immediately take in excellent design (the rainbow bathrooms are a chipper welcome off the plane). The easy, affordable, efficient Arlanda Express train will get you to the city center in 20 minutes.